One of the awesome polishes lovely Nikki kindly sent me in my suprise package I showed you yesterday was Elianto Sparkling Diva in Racing Green. 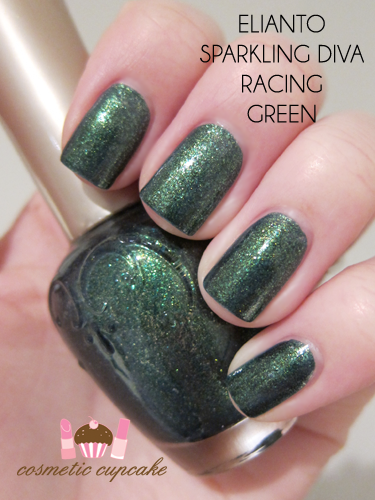 Racing Green is a dark spring green with gorgeous green and gold shimmer through it. I was worried it might stain (as a lot of greens do!) so I layered a thick coat over my underwear polish Misa High Waist Hue. Turns out I needn't have worried as it didn't stain at all. Application was a breeze - I really enjoy the Elianto formula and brush and dry time was good. Bonus bottle close up! Not only is the shade beautiful but it's such a pretty bottle too. THANK YOU for fulfilling this lemming Nikki!! =D Elianto polishes are wonderful and I need to get myself to Malaysia pronto so I can browse the entire selection! Have you tried Elianto polishes? If not you really should try and get your hands on some!! Thanks for looking as always! Oh for heaven's sake...that is one gorgeous polish! I'm trying to cut down my wishlist, but this is not helping! LOL oops sorry Janelle!! Didn't mean to enable you there xp This is definitely one for the wishlist though! I totally agree. I can't think of another colour that's similar to it! 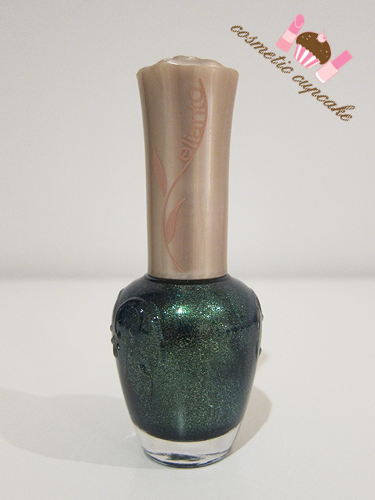 I love green and shimmer too =) special finishes are always my favourite! Ohhh so pretty :D I love dark green polish! btw the green stash is growing with this haha! Yeah make sure you do!! I have a few Elianto polishes now and they are excellent quality. The bottles look great in the stash too! Not familiar with this brand, but this is such a pretty foresty green! I have to agree the bottle is super cute too. I really wish Asian brands were more readily available in other countries. Elianto is a great brand and the colours are really lovely! I'm disappointed too =( We need more international brands here in Aus! W-o-w. What a gorgeous hue! I don't know any other colours which are similar unfortunately. Hopefully you'll find something like it though Maja!